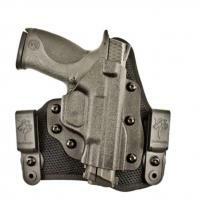 The Infiltrator"AIR" IWB holster is adjustable for both height and cant. Its holster component is adjustable precision-molded Kydex and the back component is all synthetic and "breathable." It comes with "C" Clips, and "J" clips are available.